An early adopter in the mobile app space, Best Western Hotels & Resorts prioritizes being at the forefront of technology and innovation. As new model-based and intuitive problem-solving technology entered the market, Best Western saw an opportunity to refresh its “Best Western to Go!” app and double down on its commitment to deliver personal, superior customer care – the driving force behind all its digital initiatives. Drawing from years of internal data and armed with industry insights that show increased use of apps to complete last minute bookings, developers prioritized intuitive design and ease of communication. Analyst reports highlight that 70% of all hotel loyalty members download the program’s app, which underscored the need to integrate the Best Western Rewards loyalty program. The refresh also focused on extensive code cleanup, updated components and was instrumental to launching high impact conveniences, which is essential for the app to remain nimble and scalable. New native language functionality enabled Best Western to significantly broaden the geographic area of its target audience for “Best Western to Go!,” which is comprised of current and potential Best Western guests who are the travel decision-makers in their businesses, families and organizations. Additionally, Best Western prioritized existing Rewards members, given the positive correlation between affinity and loyalty with a brand and engagement with the brand’s app. The “Best Western to Go!” app’s marketing messages also targeted Best Western hotel owners with individualized property information, as well as their staff members. The app serves as a selling feature for increased revenue at the property level. User feedback calling for a streamlined experience, coupled with market insights showing that a high percentage of mobile bookings happen on-the-go, prompted Best Western to re-think design for “Best Western to Go!” The user interface was fully restructured and modernized. Investment in user experience design resulted in a guest-first focus with intuitive navigation and controls. Research also showed that app conversions are much quicker than on mobile, so it was essential for it to be responsive and designed with utility and added-value in mind – thus, the full integration with Best Western Rewards. Given the speed at which new technologies are developed and Best Western’s commitment to staying ahead of digital trends, the brand invested in simplifying the code and migrating to a scalable platform. It chose to integrate with Runtriz and leverage its robust artificial intelligence functionality, a key step in improving communication between the guest and hotel within the app. The new “Best Western to Go!” mobile app communicates the message that today’s Best Western offers an exceptional user experience for today’s modern travelers. Taking advantage of today’s most advanced technologies, the app includes functionality that speaks to the needs of on-the-go travelers, loyal customers and Best Western Rewards members. Modern design has been paired with a simplified navigation menu to achieve an intuitive and frictionless flow. Robust technology gives users easy access to hotel staff to manage booking modifications, in-property requests and streamlined check-in and check-out. Hotel owners will appreciate the thoughtful attention given to highlighting distinct and useful features in each property and the direct communication channel with the guest. 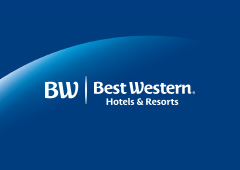 As part of its customer-driven strategy, Best Western focused its efforts around the “Best Western to Go!” app on providing guests with pertinent information and seamless access to their accounts. The app’s upgrades launched in fall 2018, with expected results to include a reduction in performance crashes from 12% to less than 1%, thus improving customer experience. Best Western also expects a reduction in the volume of customer calls to the brand’s call center as well as to individual hotel properties due to the available services and information provided via the app.